Check out their website for more infos. I have never been a jazz fan, and I am still no jazz fan but these guys really impressed me. Their music is highly creative and sometimes even FUNKY! Yay! The only drawback was the bad acoustics….not due to the venue but blame the technician who was sitting bored on a carrier box behind the sound mixing desk…. I admit I’m a lame duck, a slacker, whatever the correct expression may be….. 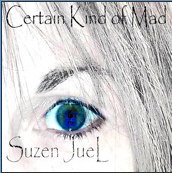 Anyway, here is the link to her album “CERTAIN KIND OF MAD” on iTunes and the tracklist. 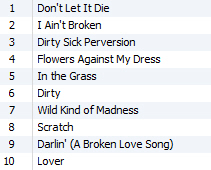 My favourites are “LOVER” followed by “FLOWERS AGAINST MY DRESS”. Meanwhile let me redirect you to my tumblelog. Here’s another trippy song I’m addicted to. When I love a song, the video usually disappoints me, but this doesn’t apply to this one. “Anything” is from Martina Topley-Bird’s debut album QUIXOTIC (2003). Also check out “Sandpaper Kisses”, if you like.